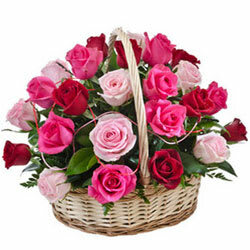 Online delivery of best wishes along with this Dazzling Falling in Love Fifteen Pink N Red Roses Basket for your dear ones. Make others feel special as you treat them with this Charming Just for You 24 Pink N Red Roses Basket in a very very special way. � 2007-2019, www.BangaloreOnlineFlorists.com, All Rights Reserved.